The RC-3 Seabee was designed by Percival Hopkins "Spence" Spencer, an aviation pioneer who built his first hang glider in April 1911. At the time he was 17 years old and constructed it from plans he found in a "Popular Mechanics" magazine. On May 15, 1914, Spencer made his first powered flight in a Curtiss Flying Boat. In 1937 he joined Sikorsky engineer Vincent A. Larsen to design their first, and only, amphibious aircraft, the Spencer-Larsen SL-12C. Development of the plane progressed slowly and in September 1940 Spencer left the partnership to form his own company. His resulting design was the Spencer S-12 Air Car Amphibian. Construction of the S-12 began on 1 March 1941 and the small, two seat S-12 prototype, registered NX29098, made its first flight on August 8, 1941. The S-12 was a fabric covered amphibian with a unique boxlike forward cabin, a high wing with a two bladed propeller in pusher configuration and a long, slender tail boom. In April 1943 Spencer left Republic Aircraft to join the Mills Novelty Company of Chicago, Illinois who wanted to use his Air Car to promote their company. Spencer used the company's wood forming equipment to build a new egg-shaped cabin for the Air Car and began demonstrating the aircraft to his former employers, Republic Aircraft. Seeing the potential of the Air Car as the perfect sports plane for pilots returning from the war, Republic purchased the rights to the Air Car in December 1943 and immediately began development of an all-metal version designated the Model RC-1 Thunderbolt Amphibian. On November 30, 1944 the first RC-1 Thunderbolt Amphibian, registered NX41816, made its first flight with Spencer at the controls. The aircraft was displayed in St Louis, Missouri in December and by the end of 1944 Republic had received 1,972 civilian orders for the $3,500 airplane. The aircraft was also demonstrated to the U.S. Navy and Army Air Corps. 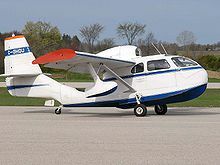 Both services were impressed with the design and on February 19, 1945 the Navy granted Republic Aviation the rights to use the name Seabee for the civilian version. The Army placed a large order for the aircraft, to be used for air-sea rescue operations under the designation OA-15. In September 1945, following VJ Day, both the Army and Navy canceled their orders, which by that time totaled over $20,000,000. The OA-15 Seabee was the last United States Army Air Corps aircraft to use the OA designation, which was dropped when the US Air Force was formed as a separate military branch in 1947. On November 22, 1945 the prototype RC-3 (NX87451) came off the assembly line at Republic's factory in Farmingdale, New York, and on December 1 made its first flight in Farmingdale with Spencer at the controls. On December 27, 1945 Republic Aviation purchased Aircooled Motors, manufacturers of the Franklin engine, to supply and build engines for the RC-3 Seabee. In March, 1946 the first production RC-3 Seabee was completed (NC87457, formerly NX87457), and on July 25, 1946 the first Seabee (NC87463, production #13) was delivered at the Republic factory to J.G. (Tex) Rankin of Rankin Aviation Industries of Tulare, California. On October 4, 1947 Republic Aviation Corp. announced that it was discontinuing production of the RC-3 Seabee amphibian for the personal plane market. Republic President Mundy I. Peale stated: "Due to the need of all Republic's production facilities for the manufacture of other types of airplanes, the company has decided to discontinue production of the Seabee". Actually, by summer 1947 the Seabee sales had almost stalled and since June 1947 the production had been put on hold, awaiting further sales. By the end of production a respectable 1,060 Seabees had been built. Though this was far from the 5,000 Seabees per year Republic had hoped to sell, it still represented a significant number of airplanes compared to other struggling aircraft companies of the same era. Only Piper, with their cheap, long-lived Cub and Super Cub, Beech's popular Bonanza, and Cessna's early 140 and 150 light planes would sell in numbers greater than the Seabee. This was due in no small part to the very low price of the Seabee. During production, however, the price of the Seabee would rise from its original $3,500 to $4,495 effective July 15, 1946, and to $6,000 on November 15, 1946, which was still a remarkable bargain for a four-seat all-metal amphibian aircraft. Republic sold its last new Seabee in 1948. By that time the demand for civilian aircraft had shown itself to be far less than anticipated, and the company turned its attention back to military contracts, developing the successful F-84 Thunderjet, which was built on the same assembly lines formerly used to build the Seabee. In 2006, over 250 Seabees are still registered and flying, a number that is increasing yearly as new aircraft are assembled from parts and wrecks. A few Seabees are still operating commercially as bush planes and air taxis. In the history of aviation few aircraft have had longer, or more successful careers than the Seabee. Interestingly, the Seebee's unusual body also garnered some Hollywood fame when it made a brief but "explosive" appearance in the 1974 James Bond movie, The Man with the Golden Gun. Modifications to increase the engine size, wingspan, cargo carrying capacity, controls, trim activation, environmental systems, landing light and many others have been available since the early 1970s. The Seabee is popular with air charter companies and small feeder airlines, and is operated by private individuals and companies. The aircraft was also demonstrated to the U.S. Navy and Army Air Corps. Both services were impressed with the design and on February 19, 1945 the Navy granted Republic Aviation the rights to use the name Seabee for the civilian version. The Army placed a large order for the aircraft, to be used for air-sea rescue operations under the designation OA-15. In September 1945, following VJ Day, both the Army and Navy canceled their orders, which by that time totaled over $20,000,000. 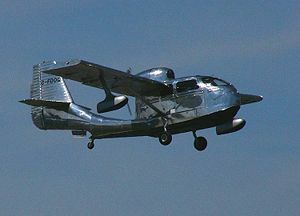 The OA-15 Seabee was the last United States Army Air Corps aircraft to use the OA designation, which was dropped when the US Air Force was formed as a separate military branch in 1947.